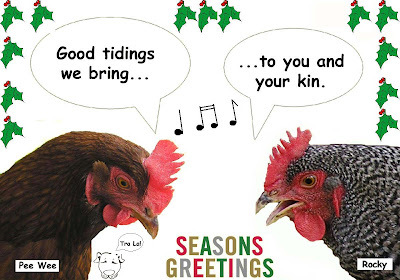 A Yellow Springs Blog: Rocky & Pee Wee: Happy Holidays! Merry Christmas, Virgil, and thanks for all your work on this blog. It's a valuable source of information for the community. How I do enjoy your daily posts. For the first time in many years, I can actually keep track of the many events around town. And even if I can’t get to every event, Susan’s photos and videos are the next best thing. Your blog is timely, inclusive, funny and easy to read. I particularly like the personal pieces you write. My friends can’t believe that I look forward to stories about chickens, ground hogs, puppies and e-book readers. Thank-you for the time and energy you invest in the blog. May you and your family have a Merry Christmas and a wonderful New Year. Thanks, everyone. I really enjoy doing this, although it is a bit harder these days with my little friend begging for attention. I'll manage.